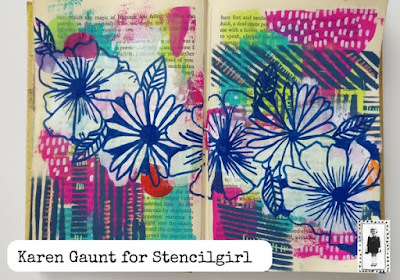 StencilGirl Talk: StencilGirl Products & Mixed Media Inspiration Deck Blog Hop - Day 3! 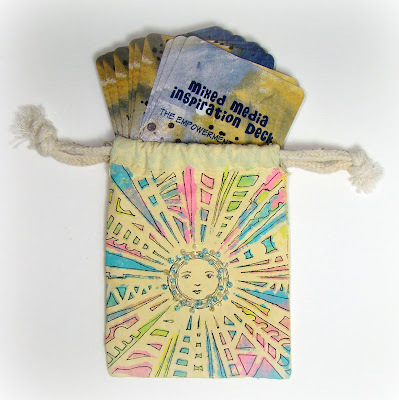 StencilGirl Products & Mixed Media Inspiration Deck Blog Hop - Day 3! 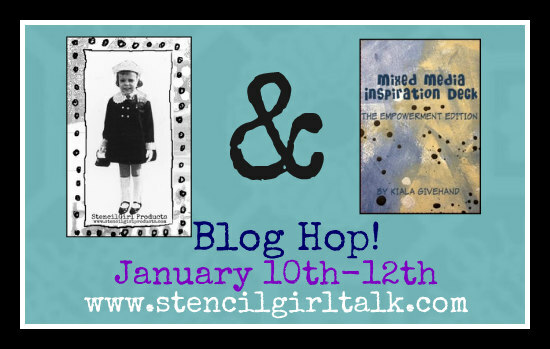 Mixed Media Inspiration Deck & StencilGirl Blog Hop! Hasn't the inspiration been fabulous! We aren't done yet! Follow the links below to see today's projects! We love the depth in Debi's art! 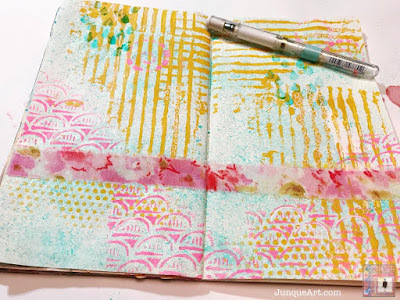 What lovely layers of patterns and movement in Cindy's art journal! See her process on her blog post here! We love that Sandee's stenciled her canvas pouch for her Inspiration Deck! What wonderfully vibrant colors in Karen's art journaling! AND a Mixed Media Inspiration Deck™ Empowerment Edition! Take your time and visit each blog showcased January 10, 11, & 12 and leave your comments. You have until Sunday, January 14th at 11:59PM Central Time to leave your comments. StencilGirl's Facebook page on Monday, January 15th. Thank you for hopping with us! MOre wonderful inspiration! I enjoy seeing the steps to create these wonderful masterpieces! Thank you for the ideas and sharing techniques! Thank you Jean for taking a look. We all love art. Happy to know you learned something new! I have enjoyed seeing all the other artists work too Denise. Such a variety of tips, techniques and styles! And there are opportunities for everyone to jump in and create. I really enjoyed seeing the work created by all the artists involved. Very inspiring! Another great day of hopping! I really enjoyed all the projects these three days have supplied. I REALLY want this deck of cards! I did not realize things like this were out there. Thanks for showcasing a great product that goes really well with all your Wonderful stencils. Great tutorials, I love the inspiration. AMAZING blog hop! 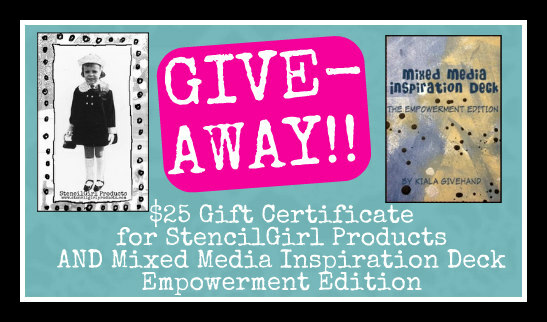 Thank you for the inspiration and a chance to win the $25 Gift Certificate to StencilGirl Products and a Mixed Media Inspiration Deck™ Empowerment Edition ! Such fun!!! Really enjoyed seeing everone’s projects!!! I really enjoyed this blog hop. What a great idea Kiala had and the combination oF stencils with the cards was delightful and inspiring. On several sites, I had trouble getting my comments to post, so I tried to post again.I sincerely hope I didn't post twice.